Yep, that’s it all right! If you have ever in your life watched an episode of Arrested Development, chances are you’re familiar with the Bluth family’s stair car. If you’re not (shame on you! ), here’s a quick summary. A wealthy family loses everything when their real estate mogul dad is arrested for various things, and one son has no choice but to keep the family together. This means, among other things, getting rid of the flashy car and replacing it with the stair car that used to be the mate of the Bluth family jet. 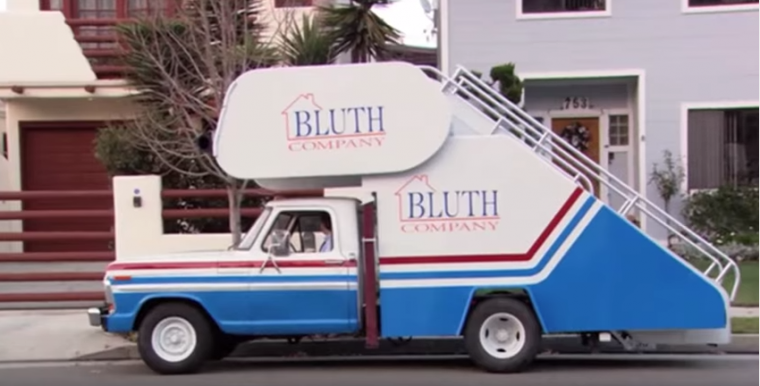 The Bluth stair car would be an ideal car for the California family, if it weren’t for the hop-ons (though it does make transporting a large number of people much easier). Arrested Development has had its heyday and the later Netflix-made season was somewhat disappointing, but that stair car will live on in infamy to anyone who once enjoyed listening to Ron Howard tell them about the Bluth family’s various misfortunes. And now, that same car will live on with a new career—a film star with a cameo in the recently released Captain America: Civil War movie. It’s certainly not a large role, yet keen eyes will notice the stair car in the background while Captain America and Ant-Man are devising a plan to beat their enemies. While the Bluth logo itself isn’t visible, there’s no mistaking the red, white, and blue décor on the side of the stair car. It’s no coincidence, either; directors Joe and Anthony Russo directed 35 episodes of the original Arrested Development before they transformed into film directors for Marvel and the likes of Captain America: Civil War. So, if you have seen the new Captain America movie and thought that stair car looked familiar, you can rest assured that it was not a trick… um, sorry, illusion.